5G is creating an environmental nightmare in more ways than technology addicts even can imagine! 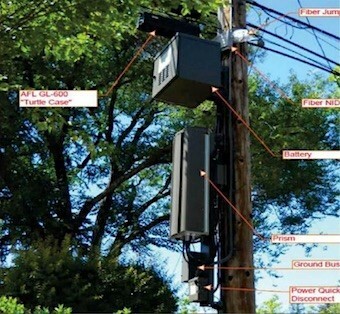 Since 5G waves don’t travel very far, innovative ‘cell towers’ of all shapes, types and sizes—including that of a refrigerator size—most likely will be ‘planted’ on a pole of some sort outside most buildings, including your home! 5G cell towers are noisy suckers, too, as they contain fans to keep them cool! Another fire hazard like AMI Smart Meters? Just imagine “whirl, whirl, whirl” all night long outside your bedroom window sending EMF radiation along with that constant droning noise! According to San Francisco, California, City Planner Omar Masry, a large cabinet “the size of a refrigerator, with noisy cooling fans for the computers, may be mounted a few feet from a bedroom bay window in a dense area of town.” Can you imagine sleeping every night with that noise and electrosmog pollution? 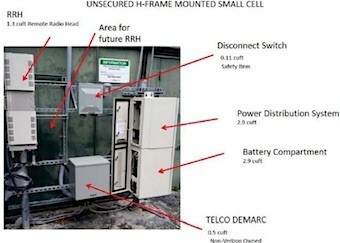 Below is what’s called an “Unsecured H-frame mounted small cell.” Can it fall over, and how secure is it, if it’s not secured? How about something like this pumping EMF radiation directly into your house? What will individual cell towers do to property values? Forget that! What will they do to human health? Frankly, no studies have been done on 5G and the FCC should be taken to task for pushing 5G cell tower installation, in my opinion. This FCC 5G irresponsibility reminds me of the Monsanto 90-day studies saying GMOs were safe, when they are not according to life-cycle rat studies  on rats feed GMO corn. Furthermore, the active ingredient in GMO agriculture–glyphosate—is found contaminating everything: food, ground water, and even vaccines . What kind of BS is the ‘consensus science’ promoted by microwave professional associations? Isn’t there anyone with common horse sense in government agencies, either? Once a person becomes EHS life is never the same. Ask the folks who had to move to Green Bank, West Virginia, in order to be able to “live” half-way normally again! EHS is questioned by the media and all who are part of the ‘consensus science’ clan, which decrees their ‘science’ as ‘factual’ by personal belief rather than what scientific methods and tests indicate. Here’s an example: 32% of microwave-industry-funded studies found non-thermal radiation adverse effects and yet, that industry’s prime professional association, ICNIRP, continues to promote that no such things exist! How patently stupid can anyone be? The very fact their industry research found 32% of non-thermal radiation adverse events  obviously PROVES they exist, and yet ICNIRP is regarded as the ‘ultimate’ in microwave industry expertise, resulting in government agencies being hoodwinked and ballyhooed by what basically is real fake science! Listen to what Martin Blank, PhD,  says about the risks of getting any type of cancer from cell towers! Furthermore, would you want a 5G cell tower outside your home or bedroom window, which can interfere with your brain’s ability to produce the hormone melatonin ? Probably no one is as well-versed in what’s going on regarding “full spectrum dominance” using EMFs and high tech electromagnetics as researcher and author Elana Freeman, who contacted me recently about my articles regarding 5G. In an email Ms. Freeman referred to us as “sisters in arms,” something I greatly value. Take in what Elana has to say, as she knows what she’s talking about, which needs to be mainstreamed. Note what she says about man-made clouds using electromagnetics and the ‘scientific’ Latin names given to them. Toward the end of this video, Elana explains what 5G will do! You don’t want to miss that information! Now, can you understand why we are having such erratically different weather patterns globally? Also, are you aware that certain vested interests are gaining financially from what’s called “disaster economics”? Is faster Wi-Fi and getting clearer Netflix really worth it? Or, are humans destined to become controlled “bots”  run and operated by all the high tech EMF devices they now are addicted to? Don’t believe that? Go back and re-listen to what Elana Freeman says about all the aluminum, etc. being dumped into the atmosphere and the reasons for that. 26-page dissertation opposing 5G legislation in California SB 649 with 360 scientific references! The mind choose faster cell phones over health, so we see zeitgeist in action.